A couple years ago, when we were half way through the design and construction of the Avery brewery in Boulder, Colorado, the team there – Adam and Breeze, Dan, Fred, Wad, Rob, Holly – surprised me with a beer called Oud Floris. It had an old man with a cane on the label as I had just hurt myself with a biking crash – I guess was not able to admit I was getting older. I felt very special that Avery did this for me. The Avery team had been fun to work with and we built a cool brewery together. It was a big transition from the alley brewery to the new site, now the beers are much better, Avery is first class and they named a beer after me, was cool. Fast forward to October 2018, the guys from Casa Bruja in Panama City – Jonathan, Stefano and Richo – invited me to brew their Christmas beer for 2018 together. We choose to brew a Tripel, one of my favorite styles. Growing up in Antwerp, Belgium close to the Trappist brewery of Westmalle, I have been spoiled drinking fresh Extra, Double and Tripel every day. I remember my father playing cards with his friends working their way through a crate of Double, that is 24 bottles! The Westmalle beers, as well as brewery, are in my top five. Jan and his team are a great example of a brewing crew that, through patience, time and diligence makes some of the world’s best beers. I am honored, again, that the Casa Bruja guys named a beer, this beer, after me – Vintage Delée! The pressure is on, now we just need to brew a good beer. Time to get going and brew something worthy. Stefano and I bounce some ideas around, we pick a yeast strain and when I show up in my Uber on a rainy Wednesday morning – waauw! can it rain in Panama – Stefano has already mashed in and on their 10 hl two-vessel brewhouse. The wonderful smell fills the brewery and the colour of the mash feels right. We decided to use Weyermann Pilsner malt and a little acidulated malt as well, you cannot brew a Belgian Tripel without some sugar so we use a local cane sugar, mildly refined, a little darker in colour. The hopping is more traditional with Saaz and Herkules. At the end of the boil we also steep the wort with some coriander and a hint of pepper, something new for me while brewing Tripel but surely appropriate since we are brewing in the tropics. 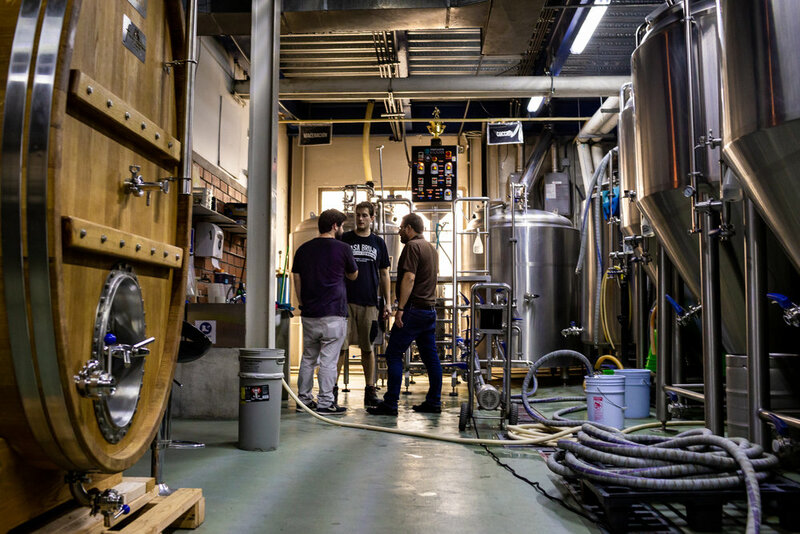 One of the best parts of brewing together is the time for stories, while the lautering is going on or the boil is humming away there is the time to chat it up, taste beers, half way through tasting the Casa Bruja line-up I realize brewers are really no better then fishermen. A brewing day is a fun day. At a quarter after four she is ready – fermenter 6, kindly bubbling away, we have done our part, now we need to hope that the billions of yeasts do their job as well, we worked hard. Muchisimas Gracias Equipo, un buen dia en la Cerveceria! proost: [noun] “cheers!” in Flemish; usually said when drinking with friends and family.